My Handmade Style: Karen from Did You Make That? Oh we’ve got a corker to kick off the new year for you. 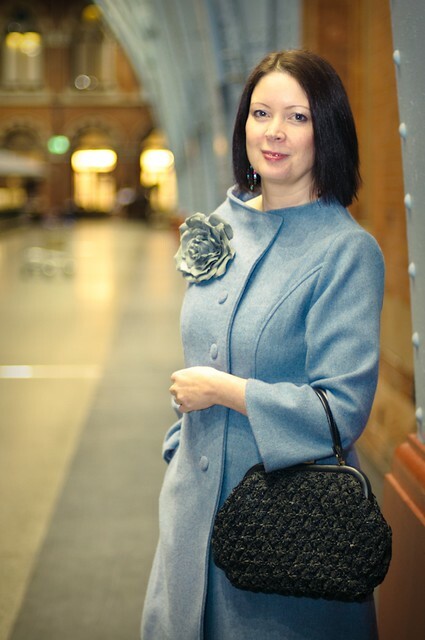 This lady is tremendously popular with you lot so who better to take us into 2013 with her style secrets? I give you… a very modest Karen Ball from the hugely influential (and hilarious) blog Did You Make That? Karen, I’ve watched you develop your handmade style over the last year or so. Your nods to vintage couture and love of colourful prints really mark you out as a stylish lady. But how would you sum up your handmade style? You’re right that I like strong colours, but I still don’t feel as though I have a particularly defined sense of style. Some bloggers know exactly what furrow they plough, and stick with it. I’m a bit of a butterfly that skitters around from one thing to the other. I feel as though my personal sense of style has maybe only started to settle over recent months. And I only think that because readers have told me so! But creativity is all about experimenting and being brave enough to make mistakes. If you have a blog, you’ll make those mistakes in public! Whenever I go to the hairdresser, I devour their copy of Vogue magazine! I love this for inspiration – soaking up colours, fabrics, just the feel of the season. Once you get past the laughably unachievable prices and lifestyle, and just treat the magazine as a mood board, it becomes a much more interesting read. I people watch like mad! London is a great fashion capital and just walking the streets or sitting on the tube, I’m surrounded by people who really know what they’re doing. Sewing meet ups have had a big impact. They’re a great opportunity to share knowledge and tips, see other people’s outfits and just get out of your own groove. Swaps are excellent for testing your comfort zone – you often go home with something you’d never have looked at otherwise. Choosing what to make is a very, very organic process for me. I am not someone who draws up a list at the start of the year (barring my Sewlutions promise to conquer the blouse). I have enough commitments and deadlines in my working life, so never plan much more than 2/3 months ahead. My stash is pretty small. I tend to start with a pattern and then find the fabric. 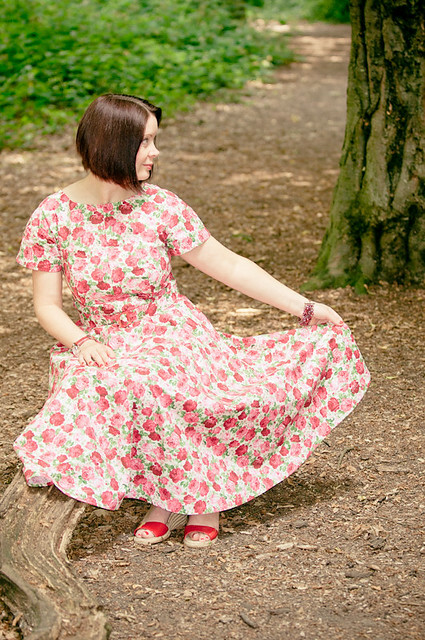 When I made the Simplicity 4934 with Beth at Sunny Gal Studios, I bought my vintage pattern and then hit Goldhawk Road. I knew right away that the lavender wool I saw there was the right choice for me. I still can’t forgive the shop for refusing me a discount, though – I bought eight metres of that stuff! is all long limbs and tapering fingers! Okay, if forced to say, I would be a female character in any novel by F Scott Fitzgerald – just without the nerves and drinking! But flapper dresses don’t really work in the mean streets of Walthamstow and I still haven’t found a speakeasy in E17. I pop into Top Shop Oxford Circus when I’m passing. I do like to see what the youngsters are up to! I love Uniqlo right now. But, honestly, um – no! In fact, high fashion annoys me sometimes. I’ve bought two peplum patterns and now I wonder if it’s even worth bothering to sew them – the peplum ship has sailed. 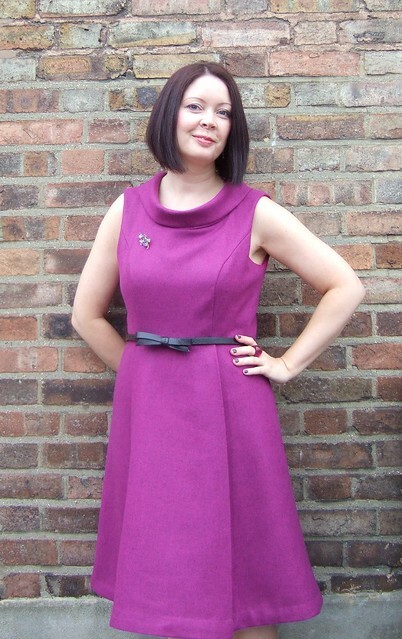 I still really like the Vogue 8667 dress that I made during my first term at Morley College. It has just a touch of retro and I used a wonderful magenta wool. I loves me a wool dress! I think that when you start sewing, you often take really big risks – you’re plunging into a whole, new world and there’s a certain amount of liberation there. Plus, you just don’t know how to make the right choices! So, yes, I’ve definitely experimented. Some of it has worked and some of it hasn’t. The Sencha blouse was a horror story for me! The Taffy blouse made me feel like a clown. Oh dear, that looks as though I’m knocking Colette Patterns, which I am not at all. Two cases of not understanding what suits me and making bad fabric choices. What HAS worked have been some lovely dresses. I love a well-fitted dress. My two versions of Simplicity 1882 were both big hits and extremely comfortable. 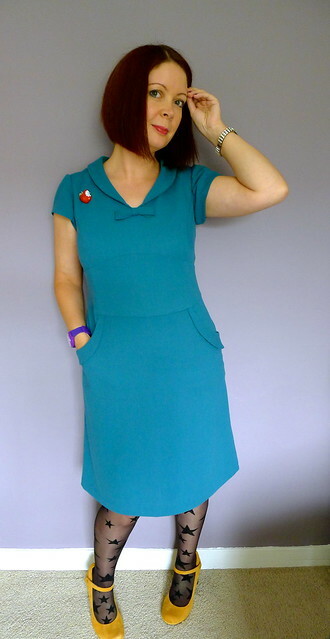 And I remain very fond of the Butterick 5605 dress I made in floral cotton for a friend’s vintage-themed wedding. Oh, the high neckline is my sworn enemy! I have a round face and need to give it space. I really admire the layered look, but not on my figure – I just look like I don’t know how to get dressed in the morning. I wear skinny jeans and jeggings but need to ensure that my derriere is sufficiently covered. I’ve realised that gathered skirts don’t do any favours for my paunch, which is a shame because they’re so easy to make! I look dreadful in most pairs of shorts. And I will never, ever wear anything that reveals a midriff. Shudder. Something comfortable! My issue with uber-fitted dresses is – what do you do after you’ve eaten a meal?! But I tend to go too far the other way and sometimes make items that are a bit roomy. I have days when I really want to cover up – then my dream outfit would be a sack (or the Vogue 1179, which I have made four times now)! On more confident days, my dream outfit would be a beautifully fitted, understated dress, maybe in wool, probably in a solid colour! I absolutely love A Fashionable Stitch right now. She has such a good eye for colour and is really doing a lot with practical, comfortable yet stylish day wear. You are a modest minnie Karen but we love you for it. What a way with wool you have! Thanks for sharing your handmade style with us. George modelling his crocheted cardigan! Greetings everyone and a very belated but VERY HAPPY new year to you all! Contrary to what you might have suspected I have not been swallowed whole by the mummy situation… although it was touch and go for a while there. 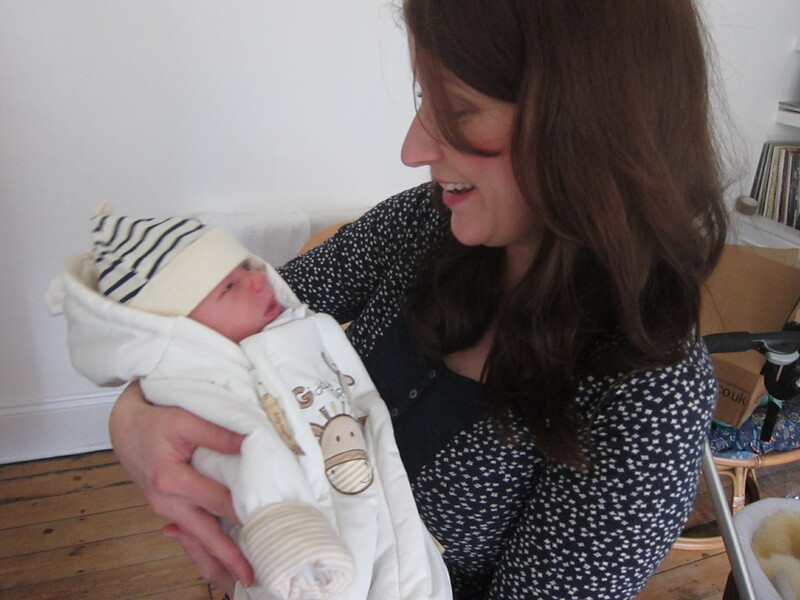 We’ve now had the unutterable pleasure that is George in our lives for five whole weeks and a day and it’s starting to feel more normal, less relentless and much more wonderful than I ever thought possible. I am determined this not to be a mummy blog though so I will say only this to keep you appraised of his situation. I mentioned in my previous post that there was a bit more drama around George’s arrival. Basically we were discharged on Christmas Eve last year and brought George home that afternoon. An evening of awfulness followed: my milk hadn’t come in yet and George didn’t seem to want to breastfeed. That, combined with my inexperience around breastfeeding (I mean – who knows how to do THAT straight out of the box, eh?) resulted in George losing an awful lot of his original birth weight. All babies lose a bit but he lost just a bit too much and so we were readmitted to hospital on Christmas Day. Yep – the turkey was in the oven, we’d started to open the presents and the midwife arrived and gave us the news after weighing him. So we trooped back to hospital and spent the next few days topping him up with expressed milk along with some vital breastfeeding support for me, and I’m happy to say he’s now thriving! He’s a sturdy hungry boyo and it’s all good. Thank you so much for all your gorgeous kind and loving thoughts on the last post. I was in tears reading them – there must be some way of printing them all out and keeping them for Georgie to read when he gets older – he’ll be amazed (and probably a bit puzzled) as to why all these lovely ladies are leaving teary emotional messages for him. We are a lovely lot aren’t we?! Uh-oh. In a moment of madness I threw my hat into Karen’s 2013 challenge and resolved to create a log cabin baby quilt with personalised EMBROIDERY as a feature. What was I thinking?! The quilt – fair enough. Once you get started it’s fairly straightforward and I’ve already made one for my niece. But I haven’t even begun to learn embroidery. Oh god – I hope Karen doesn’t throw me in the stocks and have people throw craft implements at me if I don’t get on with this pronto. But there’s nothing like public humiliation to get one’s juices flowing eh? I have been remiss in getting some fab new interviews up on the site. I already have three fantastic features in the coffers and can’t wait to get them out there for you to enjoy. These ladies are the cream of the crop and each have a very unique style. I just know you’re going to love them… when I get them up on the site! Watch out for the first of 2013 later this week. I’ve still got a baby belly (and a whole lot of stretch marks – gah!) and a bit of a lard arse so it’ll be a while before I’m knocking out fitted dresses but I’m sure I can turn my hand to a tunic or two and I’d love to create a couple more Renfrews (non maternity this time) for my post baby body. 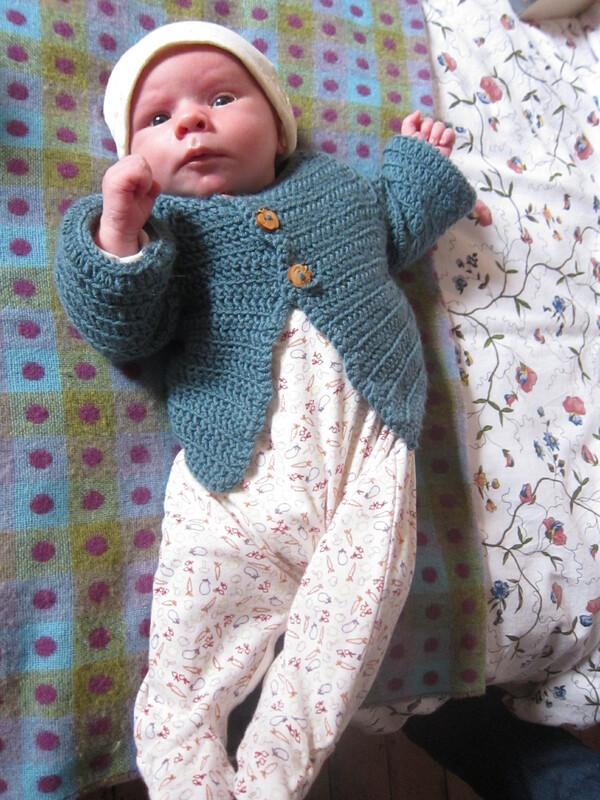 I know there are lots of mums out there – any suggestions for great post baby patterns? So my beautiful sewing room is basically now chock full of baby stuff. And it’s to become a nursery at some point in the future too… so what to do? There might be a way of combining the two for a short while, even in that tiny space, So I need to turn my thoughts to getting that sorted. In the meantime it’ll be a matter of yanking out the sewing machine and setting up on the kitchen table. And what else – ooh… Watching this little one grow, for a start.